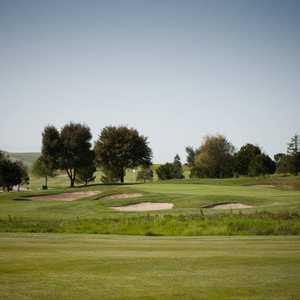 SAN JOSE, Calif. -- South Bay Area commuters, those who traverse California's prominent Highway 101 on a routine basis, are certainly familiar with Coyote Creek Golf Club in San Jose. A majority of both courses are in plain view as you weave your way through the often busy section of freeway. But from that vantage point there really is little inspiration, as the holes on the west side of the highway appear somewhat pedestrian. The few holes on the east side, while revealing slightly more intrigue, are mostly concealed by the fair-haired hills. 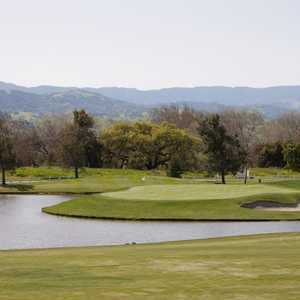 Jack Nicklaus designed both courses at Coyote Creek Golf Club in San Jose. But a closer look at the two Jack Nicklaus designs unveils a pleasant surprise, notably on Coyote Creek's Tournament Course, where those hidden holes lie. The straightforward but challenging par-4 first gives way to seven fantastic holes on the other side of the highway, via cart ride under six lanes of speeding coupes, sedans and SUVs. Just making it to the other side is reward enough, but more pleasure awaits at the par-3 second. The 195-yarder plays even tougher with the prevailing wind in the player's face, and though the green is not decorated by much trouble, par is more than satisfying. Back-to-back par-5s are next, starting with the 552-yard third, a three-shotter if the wind is up. Depending on the strength of your drive, the layup may be the most intriguing of the three shots, as players must debate whether to attempt to carry the hazard or play it safe and leave a long approach. The fourth is more tantalizing, especially if you catch your drive and land it in the right spot on the left-to-right sloping fairway. A shot at the green in two is within reason (especially with the prevailing breeze), but it must fly the grassy hazard fronting the green while dodging the thick trees that serve as goalposts. The fifth and seventh are par-3s of similar lengths (163 and 167 yards from the tips) but play as much as four clubs different with the wind factor. The latter is a pretty downhiller with deep bunkers in front and behind the green. Any tee shot that finds putting surface provides that same warm feeling of when your airplane safely touches ground on the runway. The eighth -- and last of the tucked-away holes -- is a classic risk-reward par-4, where a draw off the tee introduces trouble on the left, but leaves little more than a wedge approach. While the ninth through 15th are solid challenges, the Tournament Course truly picks up speed again on the three closing holes. The 16th is a robust 432 yards that plays almost like a short par-5 into the teeth of the wind. The 17th is yet another par-5 where the layup is the pressure shot, as players must decided whether to carry the creek to the piece of land right of the hole, or lay up short for an approach that must fly the hazard. The wonderful home hole is decked with water down the right side that eventually bends left to bisects the fairway short of the green. The natural current of air on the 431-yarder pushes drives toward the watery golf ball grave. Along with being yet another testy par-4, it represents the 18th (or 36th, if you count the Valley Course) consecutive exceptionally conditioned golf hole at Coyote Creek. Fairways are immaculate, greens roll true and fast and the bunkers -- should you happen to settle in one - are fair while still forcing a good blast for an up and down. Although the courses opened less than five years ago, the land used by Coyote Creek has a longer history. Starting in the mid-50s, it was occupied by a middling daily-fee called Riverside G.C., a popular venue for locals but little more than that. The owner of the land, Castle & Cooke, bulldozed the course and hired Nicklaus to design two new ones to take its place. While the Tournament Course opened in 1999, it took two more years for the Valley Course to be completed. That layout took up the land -- along with the mature cypress, oaks and Monterey pines -- that Riverside G.C. once utilized. Nicklaus totally renovated the old layout and added seven new holes. It is mostly because of those trees that the Valley takes on a different look that the tournament, not to mention the inclusion of four lakes and two waterfalls. The trees give more of a sheltered feel, especially from the prevalent wind, and like the Tournament, the closing holes are the most inspiring. Both layouts are routed around the impressive clubhouse, with a craftsman-style interior that includes a stylish golf shop, locker rooms, fully stocked bar and classy dining area with indoor and outdoor options. Golf carts are equipped with GPS systems, which are always helpful despite being slightly guilt-inducing. They are also advanced enough to indicate how far away the carts in front of you are, beneficial if you are playing the courses for the first time and hope to avoid beaning fellow players. Coyote Creek has hosted its share of notable players, even when you don't count internet golf writers. The Tournament Course once entertained some of the Champions Tour's best as host of the Siebel Classic in 2001 and 2002. The tournament was played over a mix of both courses. Both courses regularly welcome several Sharks, Raiders, 49ers, A's and Giants who prefer the Coyote Creek layouts to the bustling courses in the city. Coyote Creek is less than an hour from San Francisco, about 45 minutes from Monterey. It's accessible from both areas via the aforementioned Highway 101, from where it is certainly worth more than a quick drive-by.